Since patients are now visiting physician web sites with higher frequency it is very important that physician clinics and health practices provide for the scheduling of appointments online. FastHealth Corporation is a leader in making convenience a patient centered goal. 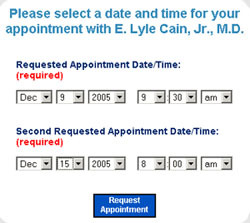 It is very convenient for a patient to request an appointment with our new algorithm based appointment scheduling system. The local hospital, outpatient clinic, or physician practice, will gain new patients by making this system available through their website. Imagine appointments made online and instant e-mail reminders automatically notifying patients of upcoming visits. Now appointments can be made online with the simplicity of making an online airline reservation. The administration tools related to this program are simple to use and allow individual physician access or central access via a hospital. This system is inexpensive and yet necessary to attract and keep patients loyal. Trust FastHealth to find simple yet advanced programs for increasing patient convenience.